I find your work very good, shark0r. You are a talented artist. 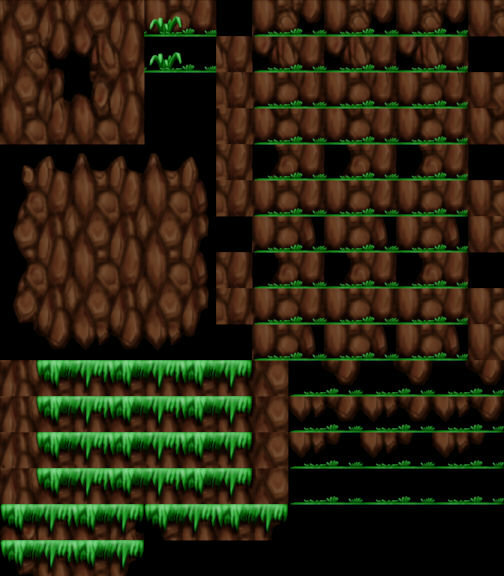 There are so many platform tiles because there are 6 grass land tiles, and 14 types of underlying rocks(include the "no rock" one), which form 6×14 variations. 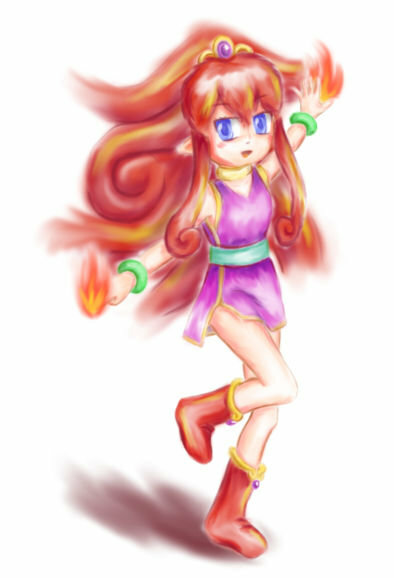 Characters from the game "Panel de Pon" by 3 different coloring methods. Character only, no background, no scene. Water fairy Elias. By MyPaint brush with smudge feature. Fire fairy Flare. By smudge tool. You can see that GIMP's smudge tool and MyPaint brush have different smudge effect. 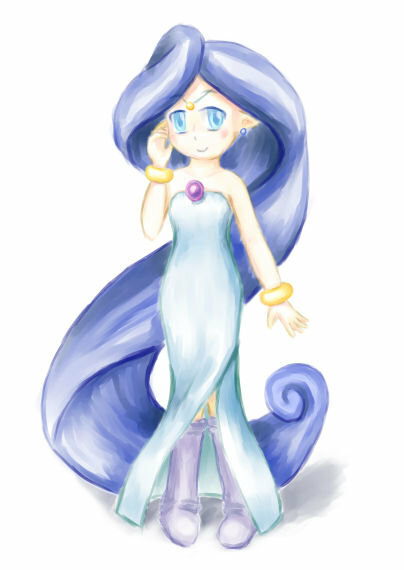 Electric fairy Rolia, a fan-made character and not in the original game. By R_Real Pencil, a texture brush in GIMP Paint Studio. 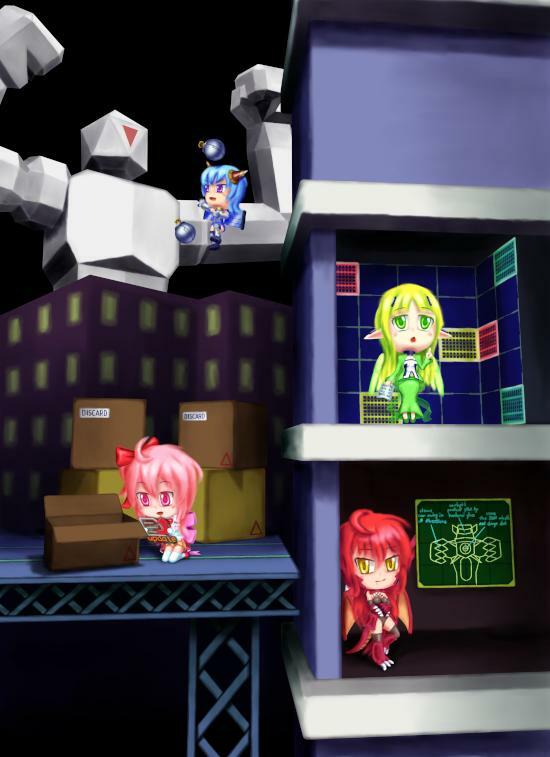 Panel de Pon(パネルでポン), released in 1995, is an action puzzle game with cute characters and fantasy world, but the game play is very aggressive. 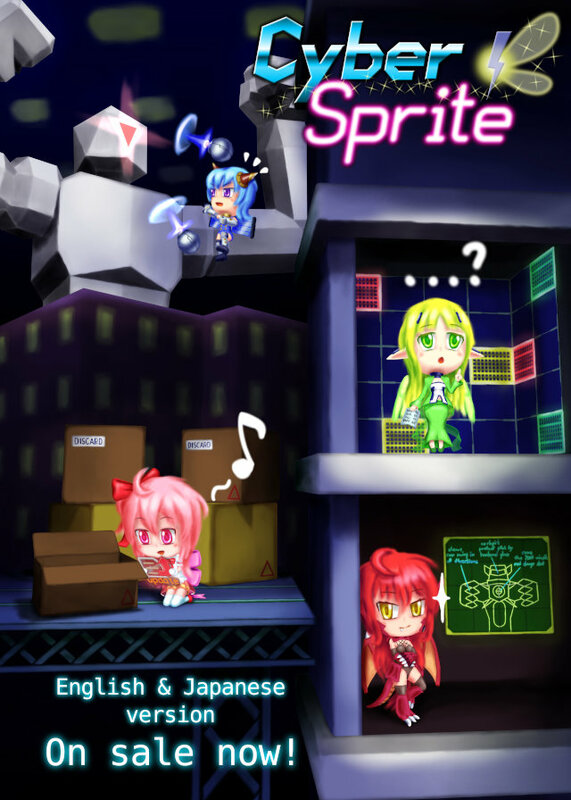 Many characters in this game have unique hair style and it's not easy to draw, especially Flare's. 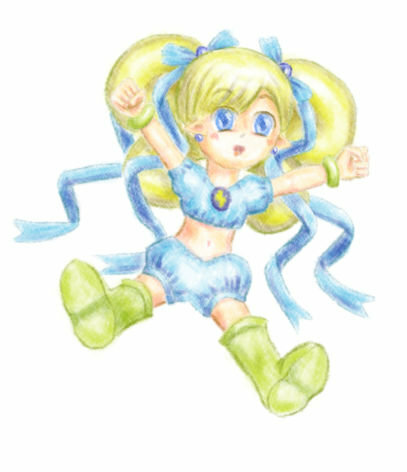 Rolia comes from this Japanese site which I found a few days ago. There are many fan arts and fan-made characters there. 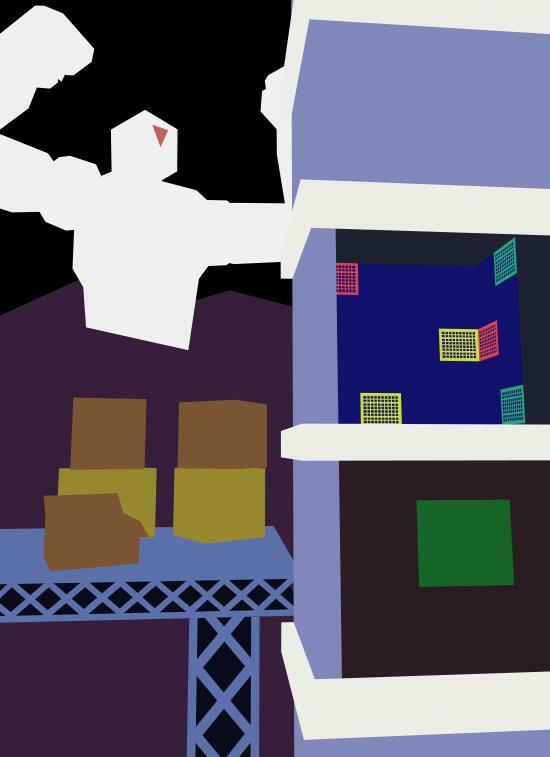 An advertisement artwork. 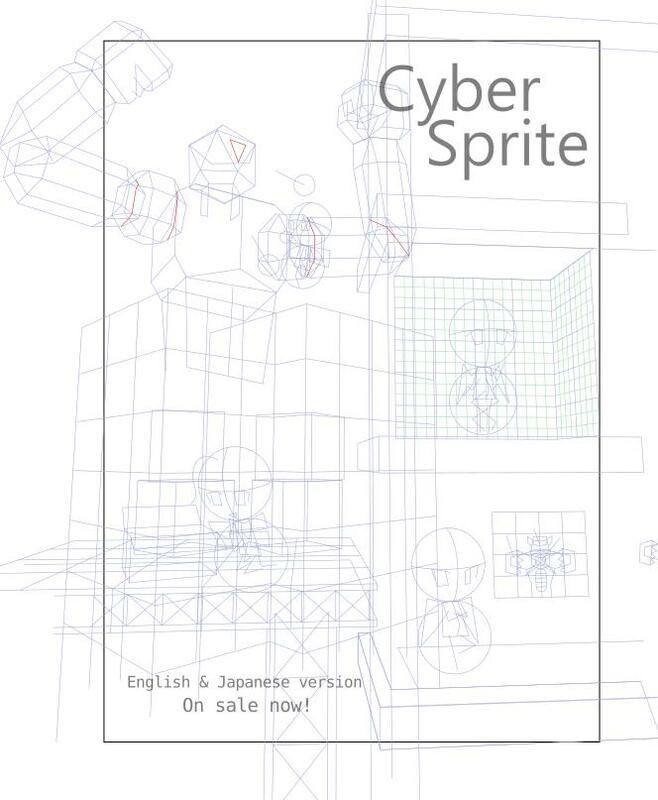 My selfmade game "Cyber Sprite" is on sale on DLsite. 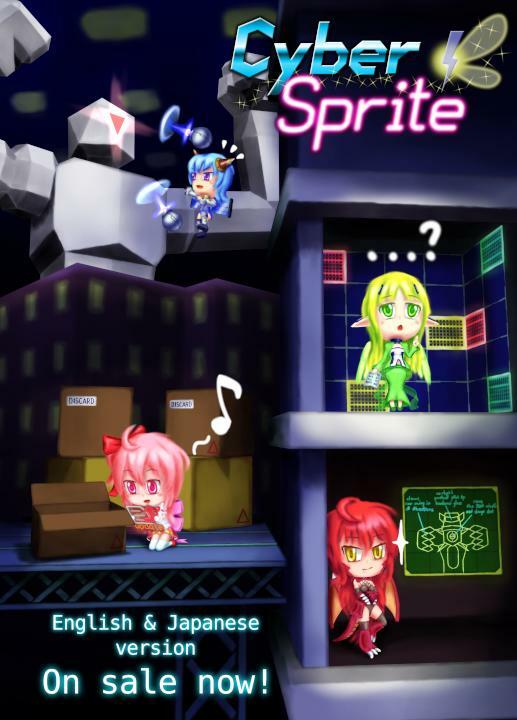 It's a 2D shooting game that characters are personified programming languages. 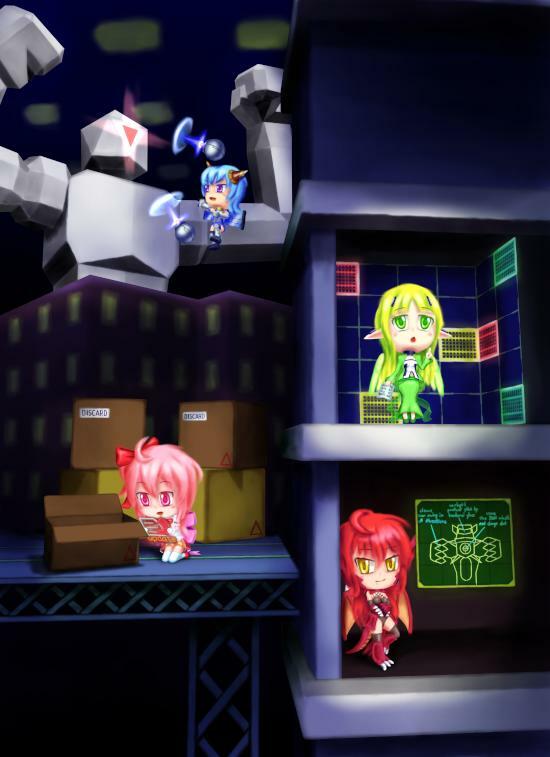 The 4 girls in this image are Lua, Tcl, Basic, and a secret character, from top to bottom. This time I show the drawing process of this artwork. Used software: Inkscape and GIMP. I use a vector software and a raster software for drawing. First, of course you had to decide what to draw. 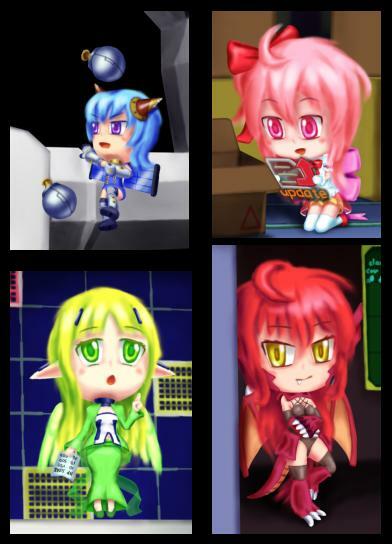 After some thinking, I decided to draw 4 main characters and 4 scenes in the game in one image. 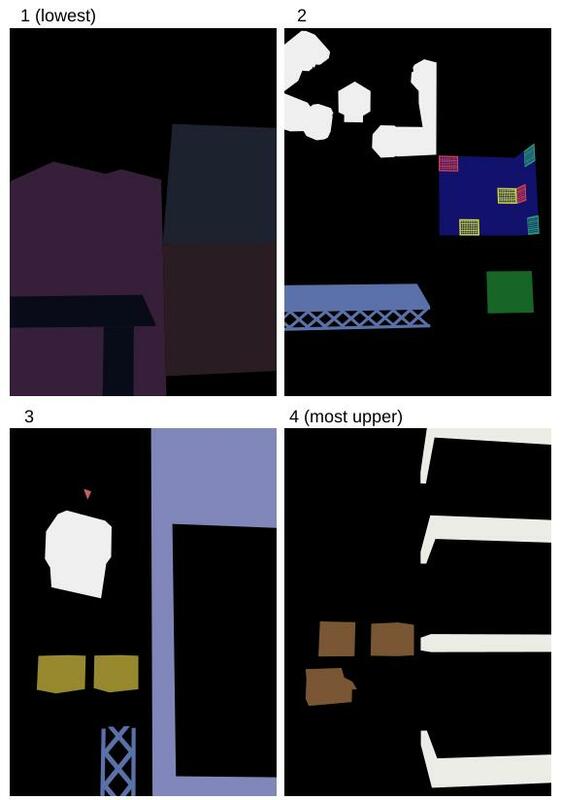 Drew a rough draft to help me think about object size and placement. Had not need to care about perspective yet. 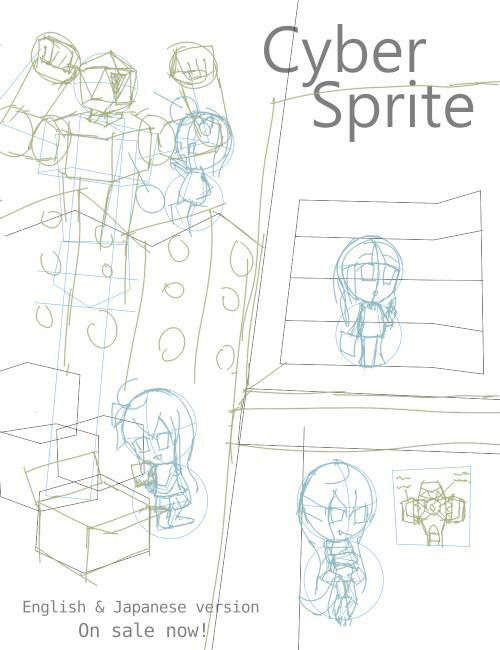 Drew a more precise draft. The perspective had to be evaluated properly. This was drawn by Inkscape. In vector software you can easily edit paths and shapes, and this is usable to draw drafts. The perspective lines looked like this. This looks complex because it needs many vanishing points to draw this artwork. There are 28 vanishing points. Some are outside of the image. I managed them in groups and could show/hide them as needed. Drew base colors of regular shaped objects. Characters would be drawn later. Splitting parts into layers could make coloring easier. The layers looked like this. This was the end of Inkscape part. Exported these layers and imported them into GIMP. 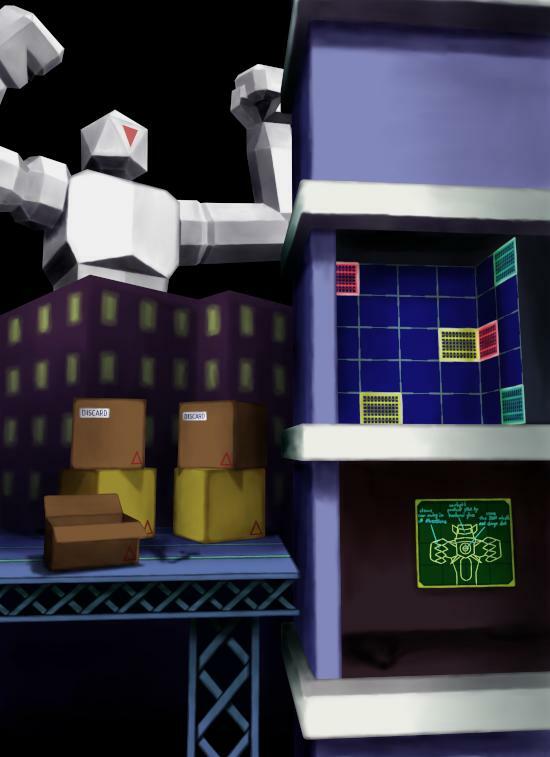 In GIMP, drew shading by Multiply layers, and added irreguar shaped objects. Background was done. Then drew characters. Added shading and lighting by Multiply and Screen layers, and drew eyes. Eyes had to be drawn carefully because eyes are the windows to the soul. Finally post processing. 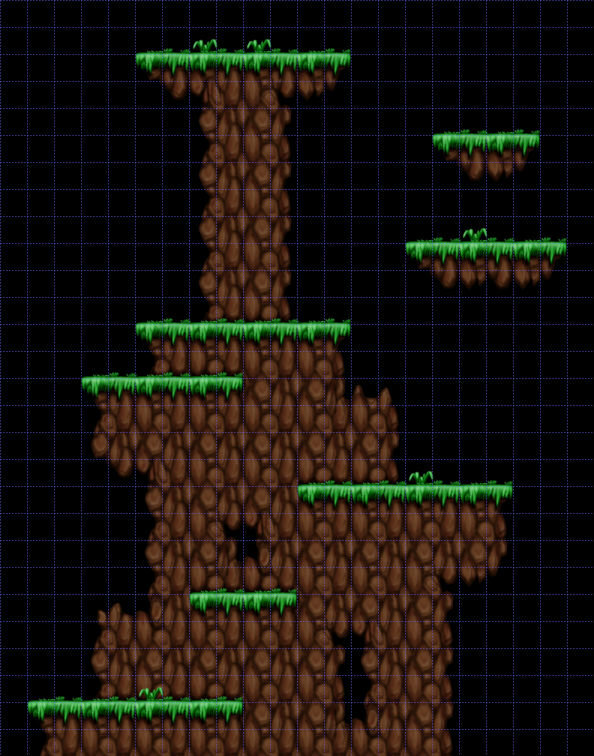 Added some Multiply, Screen, Add, and Overlay layers to adjust global lightness. Added logo, text, and emotion mark . Shrank size (It's easier to draw with larger size and adjust to desired size later). Done. From my view, I think C is a different thing from those scripting languages and not suitable to be on the same stage. 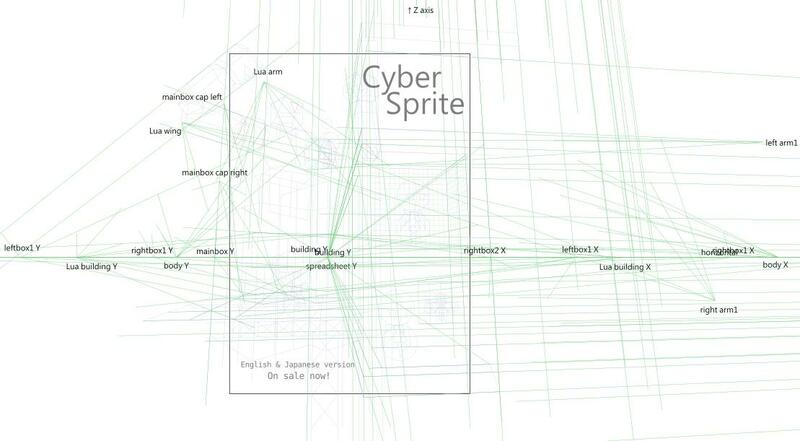 Since most scripting language interpreters are written in C.
Python will appear in our next game. But the development progress is slow due to lack of graphic staff.